There is no denying the fact that the front entrance of your home commands the most attention from the street. Therefore, it is of paramount importance for you to ensure that your new entry door is striking, secure, and aesthetically pleasing. But don’t forget your back door, either! All your exterior doors are both a key design element and a barrier between your home and the outside world. Luckily, there is a wide variety of types of entry door to choose from. Some of these options are made of fiberglass, while others are constructed of steel and wood. Regardless, all the different materials have their fair share of advantages and disadvantages. In the end, your choice should largely depend on your needs and preferences. Overall, it is far better to opt for doors that boast of tighter-fitting frames and energy-efficient cores. Having energy-efficient doors can considerably decrease your energy bills. Energy-efficient doors can also add to the overall value of your home; this can particularly come in handy when you are considering listing your home for sale. You have our blessing to find your purchase online. However, before doing so, we would also advise you to visit a physical store to truly see what you´re buying. You can’t get a proper feel for the door through pictures. We would also suggest you to visit manufacturer sites that offer catalogs and information on the materials that make up the door itself. There are primarily three different types of entry doors and they are constructed of fiberglass, steel, and wood. Let´s discuss their advantages and disadvantages. Fiberglass entry doors are largely considered a practical choice. These doors are available with a smooth surface or, more commonly, an embossed wood-grain texture. Some of these doors even undergo an edge treatment to make them look more like real wood. Fiberglass doors offer more resistance to wear and tear than steel. In addition to that, they can be stained and painted. Fiberglass doors are affordable and dent-resistant. For those who are not big fans of maintenance work, you should know that fiberglass doors require little to no maintenance. Regrettably, fiberglass entry doors are often expensive. You can find cheap ones, but they aren´t the most durable entry doors around; they can crack under severe impact and often require more maintenance than other types of doors. Additionally, if you have an older home with the doorway already attached, you will likely require a specialist to help you fit a fiberglass door if it’s a non-standard size. According to reliable statistics, steel entry doors account for about half the market! Exterior steel doors are widely popular for many good reasons. For instance, although they are quite inexpensive, steel entry doors can easily match the security and weather resistance provided by the much pricier wood and fiberglass. Steel entry doors don´t require much maintenance work and are quite energy-efficient as well. Unfortunately, steel entry doors are prone to dents, which can be difficult to fix. Also, if there are scratches on the exterior of steel doors, you should paint them immediately. Failure to do so can cause rust. Exterior wood doors are often considered more aesthetically pleasing than other options. They provide the high-end appearance that other materials attempt to mimic. Wood doors are also quite good at resisting wear and tear. In addition to that, wood doors also hardly dent. It also helps that the scratches on wood doors are relatively easier to fix and repair. However, wood entry doors do have their fair share of disadvantages. For a start, they are priced rather exorbitantly. Additionally, they also require regular maintenance; you have to paint and varnish them frequently to maintain their shine. Unless the wood is properly sealed, there is also the possibility of damage from water and insect infestation. These days, manufacturers provide multiple options for panel and glass designs, sidelights, grille patterns, and transoms. 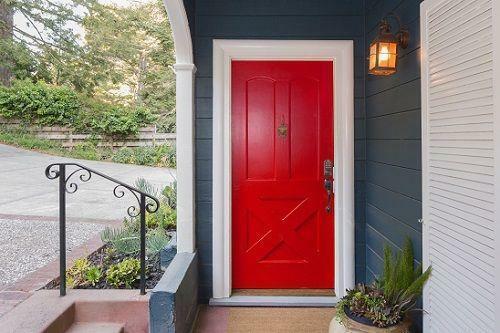 The more elaborate the design, the costlier the door is, but depending on your budget and personal style, adding some flair to your entry doors could be worth it. Installing the adjustable threshold feature can prove very useful in keeping out the elements. This feature plays an instrumental role in keeping the door weather-tight over time. With an adjustable threshold, you won´t have to add a new seep to the bottom to seal out drafts and rain. Rails and stiles are the vertical and horizontal parts that brace a wood door. While they add flair, solid-wood rails and stiles have a tendency to bow or warp in the long run. Hence, we would strongly suggest you look for stiles and rails constructed of laminated wood coated with veneer; this particular material is quite resistant to warping. There´s no denying the fact that glass inserts are attractive. However, they do add to the cost. If money is not a factor and if you decide to purchase a door that features glass sidelights or glass near the doorknob, we would seriously recommend you to think about getting a double-cylinder dead-bolt lock that requires a key to get access regardless of whether you are inside or outside. This way, a burglar or thief won´t be able to simply reach in to open the door by breaking the glass. However, you should know that not all municipalities are open to the idea of allowing double-cylinder locks as they tend to make it difficult to exit in an emergency. Thus, you should check your building department first before you decide to get one. 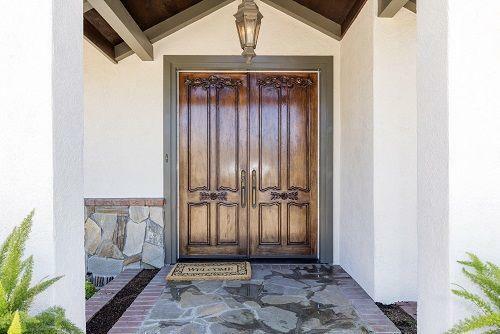 We’ve now outlined some of the most popular materials and features for entry doors. If you carefully consider your budget, available time for maintenance, security needs, and aesthetics, you can choose an exterior door that perfectly complements the look of your home.